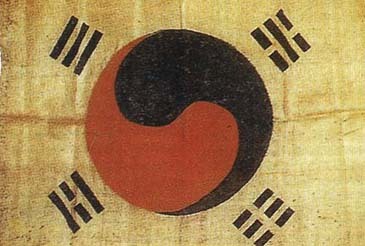 The Taegukki (太極旗), the national flag of the Republic of Korea, is perhaps the world's most beautiful. It is certainly the world's most philosophical. At its center is the Taegeuk, known in Chinese as the Taichi (太極), symbolizing the "Supreme Ultimate." Thus, an idea first formulated by the Taoist sage Chuang Tzu (莊子) in the fourth century before Christ is symbolically represented on the flag that flies over the world's most Confucian country. Yet, the people who live under this flag seem to have lost touch with this "Supreme Ultimate." The Tao (道) is difficult to define in English and is thus left untranslated. "The Way" is its literal translation, but unmodified by other nouns perhaps "The Way of Nature" is a better. Perhaps it is best to think of the Tao in terms of what it is not. Koyaanisqatsi, "life out of balance" in the language of the Hopi Indians, is its polar opposite. Yet koyaanisqatsi is precisely what one finds in modern Korea, once known as "The Lang of Morning Calm." How, then, did Korea lose her Way? During the last fifty years, the southern half of this peninsula has undergone the rapidest development the world has ever witnessed. The country went from sub-Saharan levels of poverty to become one of the world's richest countries in a mere five decades. The achievements of the Korean people in the last two or three generations are indeed remarkable and not to be dismissed. However, it cannot be denied that a half-century of modernization and industrialization has exacted its toll, and it has been a heavy one. These same processes ─ erroneously termed "Westernization" because the West was the first to suffer them ─ ravaged Christendom as well, but the nations of the West had centuries, not decades, to deal with them, if however unsuccessfully. Agrarian peoples were uprooted from the lands that sustained them and held the bones of their ancestors. From their villages with their ties of kinship and affinity, they were forced into cities that mushroomed at a pace allowing no time for planning for the future. Many found in churches the sense of community they had left behind, explaining the growth of Christianity in this country as evidenced by the sea of red neon crosses of the Seoul night cityscape. Often, the newly urbanized Koreans saw their new urban neighborhoods razed and themselves and their nuclear families stacked in characterless high-rise apartment complexes, having long forgotten the beautiful hand-made homes in which their parents and grandparents were born and raised. People seldom know those who live on the other side of their living room wall, and the "key money" system encourages people to change their abode every couple of years. Deprived of extended and varied human relationships, people increasingly find fulfillment in things. Westerners who look to the venerable traditions of the East for an alternative to the materialism that has prevailed in their own civilization for the last 300 years would be shocked and saddened to find the same modernist vice prevalent in a country as ancient as Korea. Keeping up with Kims is the order of the day. Consumerism has trumped humanism. Appliances, technological gadgetry, and other distractions have replaced human relationships. Even humans are commoditized, as evidenced by the popularity and acceptance of plastic surgery in a country where a hundred years ago people would not cut their hair because it had come from their parents. The decline in culture is seen in every field. Disposable ditties by disposable K-Pop producer-created ensembles of pretty teenagers have replaced the timeless p'ansori canon. The literati of old gathered to share tea and compose poems, today's illiterati "meet" at Internet cafés and communicate with each other with a mix of emoticons and gibberish known as "Alien Language" (외계어 ─ 外界語). Competition has replaced cooperation. The last vestiges of Confucian Capitalism ─ capitalism with a human face ─ disappeared with the IMF ten years ago. Job security is a thing of the past in the neo-liberalized economy. And nowhere is competition fiercer than in education, which now begins in the womb for the one in three children who are not aborted; parents can only afford to have one or at most two horses in the race, such are the costs of educational competitiveness. This last point leads us to the most indicative factor in the decline of any nation or species, its birthrate. Korea's is at the bottom worldwide, hovering above one child per woman, at close to half the 2.1 replacement rate. The Year of the Golden Pig has caused a infinitesimal increase, but Korea needs a Century of Golden Pigs to stave off what people decades ago correctly termed "race suicide." O Tempora! O Mores! O Corea! The list could go on and on ad nauseam and ad infinitum, and it is not exclusive to Korea. The other sinitic countries of East Asia have experienced or are experiencing the same cultural decline, and, as mentioned earlier, the West has experienced it to the point that some speak of it as the post-West. And in this call for Korea to embrace her philosophical roots, accuse not the author of a species of Orientalism, of expecting the average Korean to be a fossilized Taoist sage or Confucian gentleman. No. But a foreign observer of America should not be faulted if he were to point out the country's culture of death, her anti-Christian foreign policy, and her abandonment of her founding principles of liberty in exchange for a National Security State. It is fair to hope that every country live up to her noblest ideas. How, then, can Korea find her Way? First and foremost, she must recover the traditions of her rich culture. Clothing makes the man, and why should Koreans only don the hanbok (韓服) on holidays, if ever? Architects should abandon Bauhaus for the Korean house, the hanok (韓屋). But in addition to such surface level changes, philosophical changes are necessary. There is much insight to be gained from the "tridharma" of Confucianism, Taoism, and Buddhism. And let us remember that the first Christians called their religion "The Way" and that the "Word" (λόγος) in the first verse of the first chapter of the Gospel According to John was first translated into Chinese thusly: "In the beginning was the Tao, and the Tao was with God, and the Tao was God." Is there hope that Korea is finding her Way again? The ubiquitous "well-being" movement is surely a sign of hope, as is the growing demand for holiday time and leisure activities. One can find hope in the principles of New Urbanism incorporated in new neighborhoods planned on a more human scale. The phenomenal growth of Catholicism is another hopeful trend. There is hope with every Korean who drops out of the rat race to do something unique and different, but, sadly, many of these simply emigrate to greener pastures for a simpler life. There was hope when Wal-Mart was chased from the country with its scaly tail between its legs, and there is hope every time a Korean chooses not to patronize McDonald's or Starbuck's. But Koreans are not choosing traditional markets, restaurants, or tea houses over these foreign chains; they are merely choosing Korean imitators. Nationalism, itself a foreign import and a product of the inglorious French Revolution with which commenced many of the ills described above, is not the answer. The answer is in the "Supreme Ultimate," the Tao.